Located along the southern shore of Christian Island, Ste. 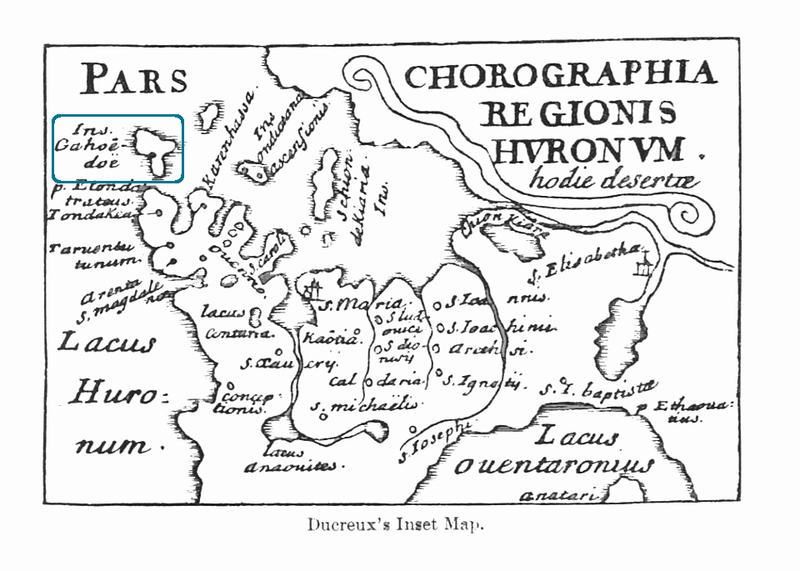 Marie II was the last Jesuit Mission to the Huron-Wendat Nation in what is now southern Ontario and was a central place in one of the most significant stories in early Canadian history. It is one of struggle, sacrifice and change, all of which left both the Wendat and Jesuits with unexpected consequences. A google map image showing the site of Ste Marie II. Copyright 2018. We begin in the early seventeenth century when the French and Wendat thrived alongside one another. By far the most comprehensive records of Wendat life are the annual accounts of the Jesuit priests who lived among the Wendat from 1634 until 1650. These regular reports by those Jesuits who lived among the Wendat are filled with descriptions of Wendat life and society. Jesuit missions in North America began early in the seventeenth century. Christian proselytization was an important component of the Christian church at this time around the world. All of these sources must be employed with caution, however, as they were written by outsiders with their own agendas. 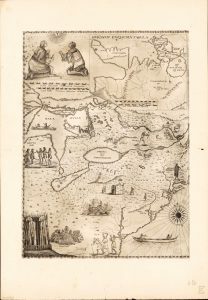 Recorded in these records were the disastrous times for the Wendat in the 1630s and 1640s. Measles spread throughout their villages in the winter of 1634 followed by influenza in early September of 1636 and persisting until spring of 1637 which was then later followed by an epidemic of smallpox that ravaged both the Wendat and their neighbours, the Tionontaté. The combined population of a strong 30,000 individuals dwindled to just 10,000- 12,000. With further destruction of their homes, villagers found refuge in Sainte-Marie I in a French fort and farm established in 1639-1640. Over the next ten years, the Wendat were attacked repeatedly by the Haudenosaunee (Iroquois) leaving only fifteen villages remaining at the beginning of 1649. 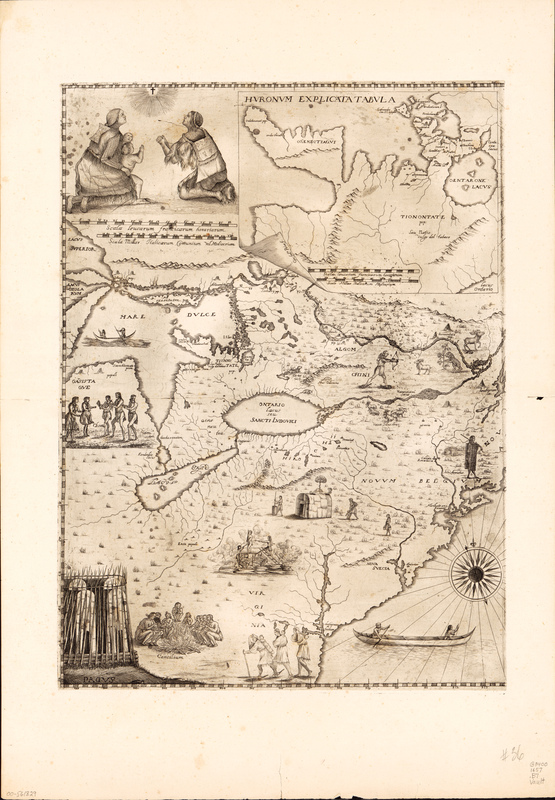 In December of that year, about 500-1,000 Wendat-Tionontaté fled to settle on Gahoendoe (Christian Island). By 1651, while an exact number is unknown, thousands likely fled to the island. The Jesuits and workmen constructed a four-cornered fort of stone and helped to strengthen the fortifications of the adjacent Wendat village. 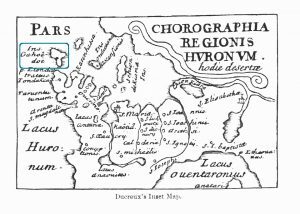 Prior to their abandoning the island in 1650-1651, conditions at the settlement were disastrous due to drought, famine, and disease. The site fell to the depths of history until 1844 when Fr. Pierre Chazelle described of the settlement remains. 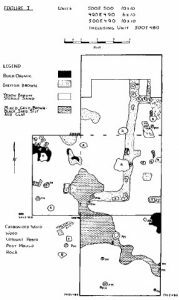 After David Boyles visit in 1898, the site was not subject to further recorded documentation or actual archaeological investigation until Wilfrid Jury and Peter Carruthers carried out excavations in the summer of 1965. 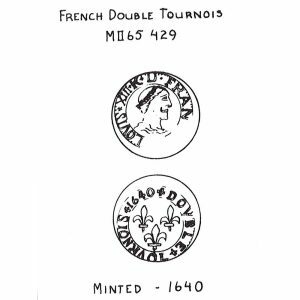 Minted in 1640, it had the profile of Louis XIII, who reigned from 1610-1643 on one side and three fleur de lis on the other. 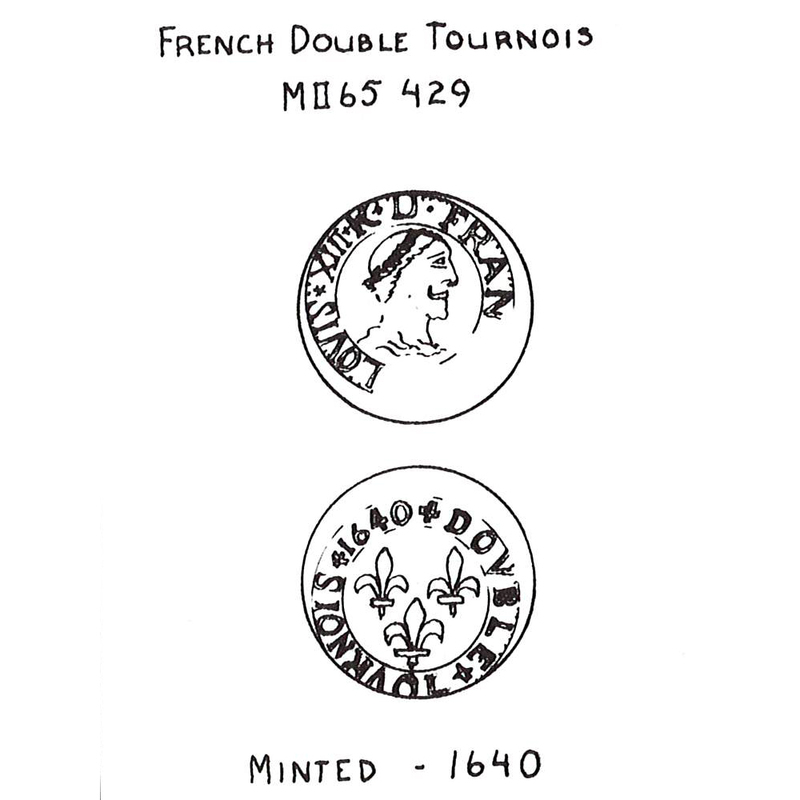 A similar coin was found at Sainte Marie I and although French money of this sort had no exchange value in the heart of Wendake, it was, nevertheless, carried to and lost at the site. 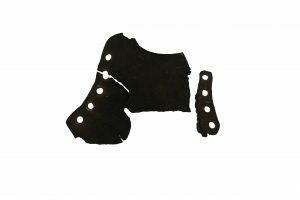 These investigations revealed low stone walls and a rich artifact assemblage that included a gun flint, an early type musket worm, a double tournois coin dating to 1640, hand-forged iron nails and various pieces of hardware including hinges, a pintle, and door locks. Fine crystal and blown bottle glass was also found that was consistent with domestic and ecclesiastical activities. The recovery of oxen bone provided physical evidence of the documentary record that two bulls and two cows were transported by raft from Sainte Marie I to Ste Marie II. Map of the 1965 excavations as conducted by archaeologist Peter Carruthers. The next major excavation was carried out in 1987 when the MOA returned to the site to discover similar features to those documented in 1965 along with the discovery of the nearby Charity site. These excavations led to the conclusion that the site was the village which refugees established on their relocation to the island in 1648. The absence of animal remains other than fish was noted by the researchers who thought that this was consistent with a record of famine at the village and fort. Preserved wood and other organic remains such as this leather from a Jesuit individual’s shoe can provide unique details about techniques of construction, wood-working skills and other data which are not normally possible on “dry” sites where organic material and metal does not preserve. Ste. Marie II, the project, combines both the documentary and archaeological records to explore Ste. Marie II from the events leading to the move from Ste. Marie I to Ste. Marie II, its occupation and its dissolution. Archaeological materials found during the Museum of Ontario Archaeology’s 1965 and late 1980s excavations on the site, together with Jesuit archives and Wendat understandings of these events, paint a complex story of the end of this early mission and the Wendat decision to move with the Jesuits to Quebec, a land with which they were familiar. With each artifact and account, the fort and village of Ste. Marie II will be revealed, telling a story of hardship, perseverance and complex relationships between the Jesuits and the Wendat people. Click here to experience this online exhibit developed with the support of the Community Stories Investment Program, Virtual Museum of Canada. The Virtual Museum of Canada is managed by the Canadian Museum of History, with the financial support of the Government of Canada.